I just got a (new to me) C&P old style 10x15, from 1899. It’s in great shape and works well. I do have a question that I’m hoping anyone with a similar press can answer. 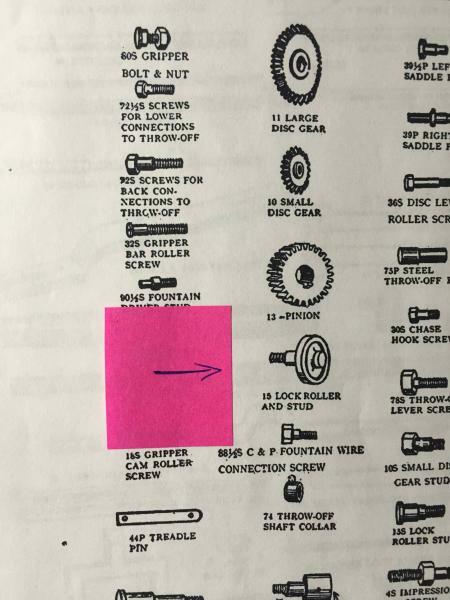 The lock roller has a flat spot on it. Once per revolution, it thumps and stops rolling until the cam make a cycle. It doesn’t affect the operation. Nevertheless, it seems like the roller should be round. I can’t tell from the documentation. I’ve attached some pictures. Can anyone verify what this part should look like? Mike, easy fix, the same thing was wrong on my 1913 8x12 C and P.. 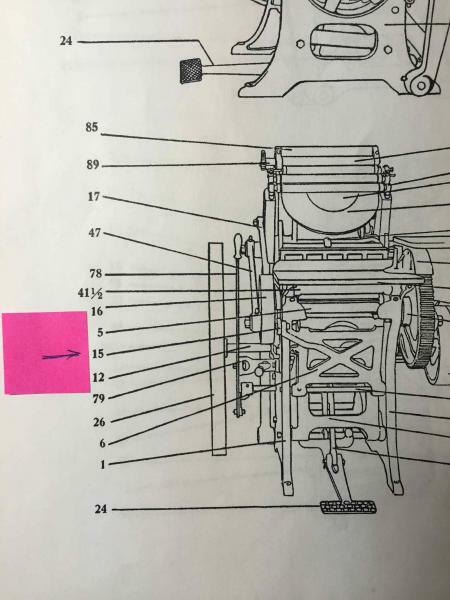 When I got the press in 1959 the roller had the same flat spot on it. Took the roller over to a family friend who brazed up the flat spot then turned it down on his lathe. That was 56 years ago, the friend has long since passed but his repair job has lasted going on 1,480,000 impressions . I know the impression count is correct because I never turned the counter back. The roller never got flat again, just keep it oiled! Buddy!. Thanks for the suggestion. I would not have thought to braze the roller… Now for the more difficult part - finding someone who can do it (in NJ if anyone knows one)! With that said I doubt I’ll ever get to 1.48 million impressions. Certainly not on a treadle operation. Either way though you confirmed it should be round, much appreciated! if you take it off and send it to me i will braze and turn it for you. Yes it is to be round. i am in milwaukee area, Wis. Sometimes this happens because the surfaces were greased, rather than oiling down the oil hole. The roller will just slide when it should turn. Take a pipe cleaner to every oil hole, and if it takes more, a twist drill used manually can remove deposits. On the thought of cleaning oil holes… I ground the tip of an appropriate sized drill bit so it was flat and used that to clean out oil holes. Works great without worrying about marring the part beneath the hole. As P_I points out, this is the result of lack of lubrication on the wheel. It froze up and stopped turning, so it was worn down. 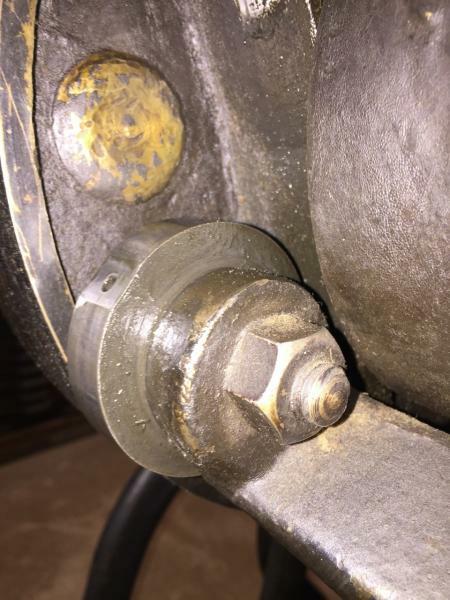 BUT - since this happened on your press, I’ll bet the same thing has happened on another nearly identical roller bearing - the one that controls the platen motion as the press closes. This one rolls around inside of a track on the big gear on the right. It controls the rocking motion of the platen. And, when it wears down, it allows the platen to “flop” a bit as it goes on impression. To test for this problem, lay your arms across the platen, with your elbows on the near edge. Grasp the platen on the other end and see if it rocks up and down. If it does, you may want to replace the other wheel as well. It’s hard to find without a road map, but if you look down to the right - towards the big gear from above, you may see it. 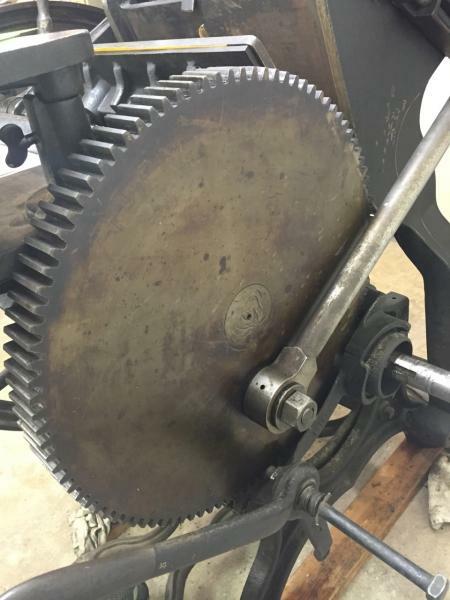 Then look in through that 2” round hole on the big gear on the right, and rotate the press, you will see a large nut on it when it aligns with the hole. It can be replaced, and will cure that rocking motion of the platen. Be sure to oil your press every time you turn it on. 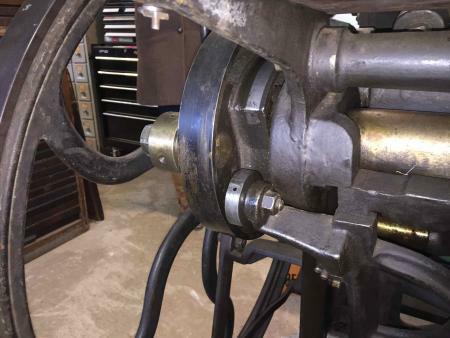 Most oil holes don’t need frequent attention, but the side arms and the main crankshaft do - especially the two bearings on the sides but perhaps even more important is the treadle hook, if you have one. I have a press here now whose crankshaft developed a groove where the treadle hook hung. The groove was so deep that it pinched the hook first time I went to use it… The brittle cast iron hook snapped from the strain. I ground the shaft straight again and installed a steel hook instead of the cast-iron one that came with the new treadle. These presses love oil, and the correct procedure on old machines like this is to oil them until the oil drips out through the bearing surface below. For this reason, make sure there is something under the press to catch the dripping oil. BTW - When I service a C&P, I use a piece of threaded rod to clean out the oil holes. It works very well. With a long piece, I can even get into the oil hole for the right-side roller bearing I discussed above. Thanks all for the tips! It’s great to know there are other folks out there who are experiencing the same things. I had to move the press out of a basement, and in doing so was able to clean out many of the oil holes when it was disassembled. The others I’ve taken a drill bit to and oil’s leaking out so I think it’s in pretty good shape. parallel_imp - I was trying to figure out how the flat spot was created. It is centered on the oil hole, so it took awhile before I even realized the roller was supposed to be round. I’ve now cleaned off what deposits were left on the cam/roller. Alan - Thanks for all the thoughts. After some contortion, I was able to watch the roller in the track on the right side. It’s thankfully rolling smoothly, at least for the 50% or so of the cycle I can see. The wheel unfortunately doesn’t have the 2” hole you reference (see picture - perhaps they added the hole after 1899?). When grasping the platen and pushing it forward and back, there is a little play, perhaps about 1/16” or so. However there is no play when the platen is closed and the lock engaged. It seems like it’s making good impressions. I imagine there would have to be some play or the roller wouldn’t have room to roll in the track. Should I worry, or let sleeping dogs lie? I’m not sure how I’d get the roller out even if I wanted to make an attempt. It’s also funny that you mention the treadle - mine too has a groove, but thankfully it’s not interfering with the hook. I’ll be sure to keep it well oiled.